I have a serious banana bread addiction, to the point where it’s a regular feature of my working week. On particularly grey days, the love affair grows ever stronger and inevitably there’s a short detour past Federation Coffee to pick up a slice before starting the day. Whatever time of year, freshly baked banana loaf with a steaming mug of tea is a combination that ceases to go stale. But with mounting concern over how much my ever more frequent detours were costing me, and faced with a bunch of pungently brown bananas, I recently decided to take the problem in hand by going homemade. Taking a traditional banana bread recipe, I’ve made a few adaptations; primarily including courgette and buckwheat flour to make it both gluten-free and more savoury. However, whilst searching alternative variations, a number of recipes also suggested using chia seeds to help bind the mixture and on account of their additional benefits, I decided to add these in along with some walnuts. However, neither are essential and for a nut-free version leave out the walnuts and substitute the almond milk for rice/oat or soya. 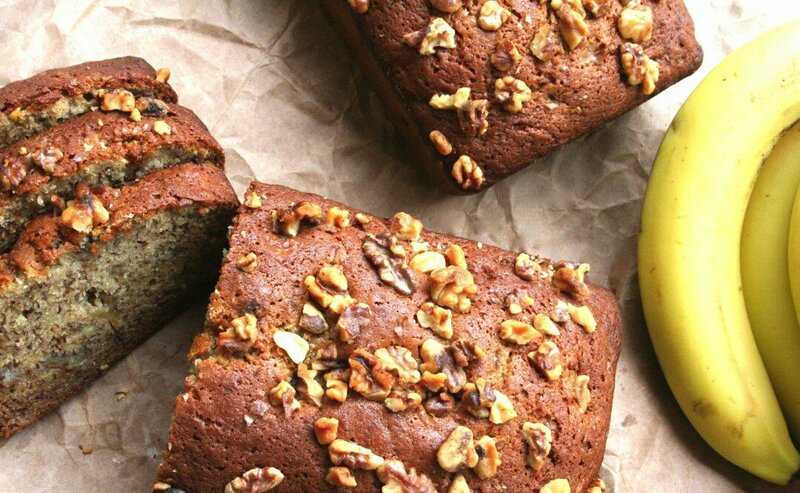 Moist from the courgette and with a natural sweetness from the over-ripe bananas, this definitely falls into the cake category as opposed to being overtly savoury. Yet the combination of buckwheat, walnuts and chia provide a solid loaf-like texture and distinctively nutty taste. Take my word for it – toasted for breakfast with melted butter, or fresh out the oven just in time for tea – this mighty loaf comes highly recommended. Preheat the oven to 190 degrees and lightly grease and line a loaf tin. Mash the banana and whisk with the eggs and a splash of almond milk, along with the vanilla extract. In a separate bowl, mix together the flour, chia seeds, baking powder and ground cinnamon. Stir in the wet ingredients and gradually fold in until mixed well, you want a thick, smooth batter-like texture. Pour into the tin, smooth the top evenly then bake in the oven for 40-45 minutes, until golden, risen and a skewer comes out clean. Leave to cool in the tin for about 10 minutes, then gently tip out onto a wire rack and serve whilst still warm, or leave to cool completely and store in an airtight container.